Pragma Securities (Pragma), a multi-asset quantitative trading technology provider, has published new research showing that the Securities and Exchange Commission’s (SEC) Tick Size Pilot Program has had a negative impact on market quality and execution – costing investors more than $300 million since it was implemented. The research paper, entitled ‘Tick Size Pilot – Evaluating the Effect of the Pilot Program on Execution Quality’, estimates that investors trading stocks priced under $40 incurred significant costs. The total additional cost for all Test Group stocks could exceed $350 million by October 2018, when the pilot is expected to conclude. Born out of the Jumpstart Our Business Startups Act (“JOBS Act”), the SEC’s two-year Tick Size Pilot Program commenced in October 2016. It was intended to evaluate whether widening the minimum quoting and trading increments – or tick sizes – for stocks of smaller capitalization companies (under US$3 billion) would improve the market quality to the benefit of U.S. investors, issuers and other market participants. Read the Wall Street Journal’s incisive article to learn more about the Tick Size pilot program. On 25 May 2017, the FX Global Code of Conduct was launched to promote the integrity and effective functioning of the wholesale foreign exchange (FX) market. One year on, nearly 200 firms, ranging from central banks to algorithmic trading providers and ECNs, have signed statements of commitment to the Code. Despite the deadline for signing ups passing on 25 May 2018, there are still institutions that are yet to sign up the Code and thus, a long way to go before it achieves widespread adoption. Moving forward, Rutherford believes institutions shouldn’t immediately be penalised for having not signed up. “For now, an institution could probably make a good case for why they haven’t done so yet because they are waiting for the final details on last look, anonymous trading and cover-and-deal to be decided by the working groups.” However, Rutherford added we can expect to see central banks refusing to do businesses with those who haven’t signed up to the code. The ACI FMA is a trade association which represents over 9,000 financial markets professionals. The ACI was the first to set an industry standard in the 1970s with its ‘Model Code’, which was retired upon the launch of the FX Global Code last year. As a strong believer in setting an ethical standard, the ACI has supported the launch of the Code with its ELAC portal, an online platform which provides FX professionals with continuous training and certification. It also offers an online version of the FX Global Code Certificate which formally tests an individual’s understanding of the Code’s 55 principles. Looking beyond the first year of the code, Paul Chappell director of education at the ACI Financial Markets Association, believes the industry has more room for improvement in relation to adoption of the code. “There are elements of the code – particularly around pre-hedging as well as last look – that demand a significant cultural shift and some large market participants have a long way to go in this respect,” he says. Pragma is one of the leading algorithmic trading technology providers in the FX and equities market. The company recently made headlines with its statement of commitment to the Global FX Code. Pragma believes algorithmic technology lends itself to aiding traders with their transparency requirements, as each transaction is databased and therefore easy to analyse. A less successful part of the Code is the rate at which buy-side institutions have signed up to the code. “If you look at the public registers, there are certainly fewer buy-side participants that have signed up to the code. I think there is a sense that the code was pointed towards the sell side, because that is where the bad behavior in the FX market was uncovered, therefore the buy side feels less urgency to sign up,” according to Curtis Pfeiffer, Chief Business Officer at Pragma Securities. It is clear that the Code is the first step in a long journey the FX market is taking to improve its reputation. To reach full effectiveness there needs to be unanimous adoption across the industry. There will need to be a further push to get market participants such as buy-side and corporate treasurers to commit to the Code. On the other hand, there are aspects of the Code such as last look, anonymous trading and cover-and-deal, that will need to be developed before some institutions commit. To make sure there is always someone on the other end of a sell or buy order, exchanges need constant liquidity. A traditional exchange incentivises such liquidity by rebating those who provide bids and charging those who accept them. This has been the traditional pricing model of exchanges until inverted exchanges arrived. On an inverted exchange, the opposite is true. It charges those who provide bids and rebates those who accept them. It has been suggested the price of the original share rises greater (information leakage) in this model when compared to the traditional model of charging them. An in-depth study by leading algorithmic trading provider, Pragma Securities, put this hypothesis to the test using their own randomised algorithm, they concluded that using an inverted exchange does not affect the price of the original share when compared to the traditional exchange pricing model. Markets have become increasingly regulated, competitive, and complex and this has led to the rise of inverted exchanges. This pricing model reverses the traditional and offers a rebate to liquidity takers and charges liquidity providers. As brokers are keen to reduce costs wherever they can, this new model has become very popular since its inception, with Nasdaq, NYSE, and BATS providing their own inverted exchange. Pragma’s 2010 study on ‘Inverted-Price Destinations and Smart Order Routing’, revealed the extent to which these destinations were popular. Inverted exchanges consistently captured the inside quote when compared to traditional exchanges, even though these platforms had significantly less liquidity and market share. 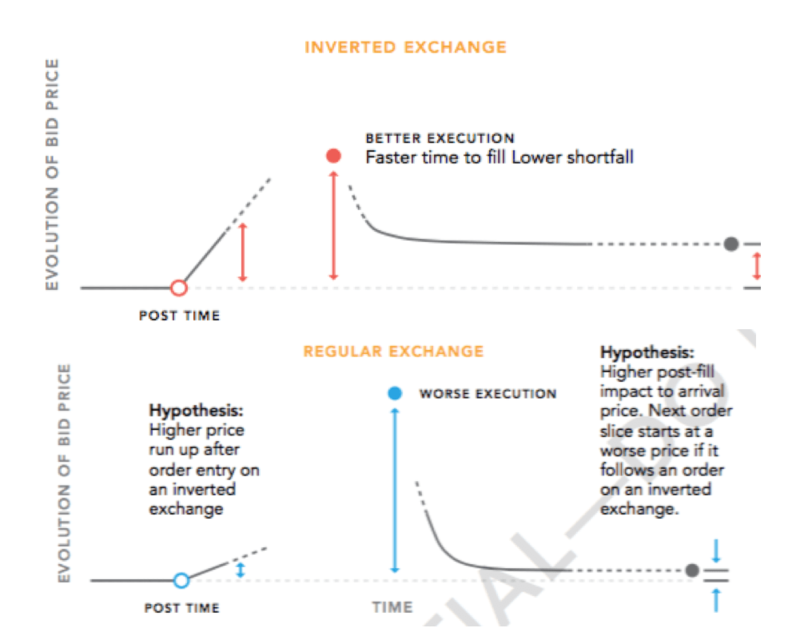 Orders on inverted exchanges effectively hop the Intermarket queue and have a higher probability of fill, lower adverse selection, and ultimately less shortfall relative to the arrival of the child order. With all these known benefits, it has been suggested that the presence of orders on inverted exchanges reveals more information about the strategy of the buyer, consequently increasing the price of the original share when compared to posting an order on a traditional exchange. Ultimately, we cannot make any presumptions about the execution quality of inverted exchanges with the data that typically has been used to make that case. However, we haven’t so far proven whether inverted exchanges do the opposite. Join us in the next part of this study, where we will show why inverted exchanges do provide better execution quality. Over one-third of traders cite ‘best execution’ as their greatest daily trading issue according to a recent report by JP Morgan. The FX industry is looking to all aspects from, exchanges, market infrastructure providers and algorithmic trading to aid them in solving this problem. The report entitled ‘e-trading trends for 2018‘ surveyed over 400 institutional traders to gain insight into what they think the main issues and trends will be in the year ahead. ParFX, a spot FX platform has measures in place to improve execution quality such as its unique randomized pause and enhanced trade cycle transparency. The company’s CEO Dan Marcus explained on Bloomberg TV that, “As a venue, what we’ve always tried to deliver is best execution, what you now see is there is more transparency, more surveillance, more systems, more controls, to sure we deliver the best execution that the regulators can see is traded in the market.” ParFX’s measures were put in place to remove the negative impact some high-frequency traders were having on the FX markets. By reducing this negative impact, ParFX has provided traders a fast, reliable and ultimately accurate platform where orders can be carried out efficiently. Traders are also looking to algorithmic trading to improve the quality of their execution. Curtis Pfeiffer, Chief Business Officer at Pragma Securities, believes the rise of algorithmic trading, which now accounts for more than one-third of flows in institutional currency markets, is due to how market prices and execution prices are databased. A database makes it simpler for their clients to carry out analysis of their execution quality and therefore improve their future decision making. CLS is also providing tools to aide traders achieve their best execution goals, with the timely release of CLS’s FX Forecast data. This new tool provides subscribers with a forward-looking view of FX markets on an hourly basis, enabling them to quickly detect potential price movements and identify times to trade with greater liquidity, reducing market impact and signaling risk. In a financial landscape where liquidity seems abundant, new innovative technologies are aiding traders to maximize best execution, however, it remains to be seen whether this will address what is now the biggest concern facing traders today. For daily updates from Chatsworth Communications follow us on Twitter. On the 15th January 2015, the euro crashed 20% against the Swiss franc in a matter of moments, before recovering rapidly. Similarly, on 7th October 2016, sterling plunged in value by over 9% against the dollar, again regaining most of its value minutes later. These are amongst the most famous examples of the market phenomena know as the ‘flash crash’, but they are by no means the only examples. In fact, according to a study by algorithmic trading technology provider, Pragma, which aims to help monitor and track the prevalence of flash crashes, there were some 69 flash crashes in 2015 and 2016. Almost one a fortnight. The causes of these market phenomena are unknown. It has been suggested that flash crashes are the result of ‘fat-fingered traders’ or lapses of human judgement. After the pound sterling incident, the Bank of International Settlements (BIS) released a report which suggested technical error as a possible cause. However, as most research has considered these events as of one-off incidences, drawing generalised conclusions has been difficult. Without other flash crashes to compare, it is not possible to tell which variables in a complex market are contributing to the crash and which were incidental. For example, some commentators have suggested that a principal cause is algorithms overreacting to news events, but further study has found no particular correlation between other flash crashes and news events. This is where Pragma’s research is vital. It has analysed two years of tick by tick foreign exchange data to identify and catalogue all instances of flash crashes across numerous major currencies between 2015 and 2016. To do this, it has developed a precise, quantitative definition of the flash crash. Using this standard, the examined time period had 69 instances of what would be considered a flash crash. This dataset allows industry analysts and academics to more accurately examine the causes of flash crashes and what effects such as changing technology, regulation and industry practices are having on market quality going into the future. For now, the causes of flash crashes remain unclear. But Pragma’s research provides an important foundational step in moving the market towards a more full understanding of this market phenomena. For more information, you can request Pragma’s research report here. You can also read more about the report on Bloomberg and Reuters. Leading industry trade publication FX Week has announced the winners of its prestigious e-FX Awards, which included two of Chatsworth’s foreign exchange clients. The awards recognise firms from across the foreign exchange industry for their excellence and innovation in the world’s most liquid financial market. Announcing the award winners, FX Week editor Eva Szalay said technology in the market was “booming”, pointing out that “innovation has been extended to small start-ups, as well as the largest players” and highlighted the market’s “genuine desire to become more transparent, more competent and highly innovative”. Innovation was certainly in evidence from algorithmic trading technology provider Pragma Securities, which was named Best independent algorithmic trading technology provider, and post-trade distributed ledger technology company Cobalt, which was awarded e-FX initiative of the year award. Reflecting on the increasing sophistication amongst the buy-side and the push for best execution in FX, Pragma has seen rapid growth and expansion over the past 12 months. The company serves banks, brokers and sophisticated buy-side institutions, and identifies its value proposition around transparency and control as differentiating features. It added a number of new capabilities to its Pragma360 algorithmic trading platform. This includes algorithmic trading non-deliverable forwards (NDFs), which offers traders better execution when investing in popular emerging market currencies. It has also expanded its international client base through a new connectivity presence at Equinix’s LD6 data centre in London, providing lower latency connection to London based FX matching engines. Cobalt has a very eye-catching proposition – it uses distributed ledger technology to cut 80% of the costs of post-trade reporting. Founded by former Traiana executive Andy Coyne, and Adrian Patten, the company is offering to completely revolutionise the costly and time-consuming way in which post-trade FX services are conducted, cutting out duplication by storing records of all transactions on a single distributed ledger. “I think if we are successful, the biggest impact will be on trading and Cobalt will increase volumes. Post-trade costs are a tax on trading and the idea that you can charge someone 50 cents to a buck for sending an unencrypted message to the back office is ridiculous. “So if we can reduce those costs by dollars per transaction, that will feed into increasing volumes,” Patten tells FX Week. The team at Chatsworth would like to congratulate both Cobalt and Pragma on their well-deserved award wins. Curtis Pfeiffer, Chief Business Officer at Pragma Securities, explains to FX-MM how corporates could stand to benefit from using algorithms for FX execution. Why should corporates consider using algorithms for FX execution? Corporations want to maximise profit, and a penny saved is a penny earned. Algorithmic trading can contribute to the bottom line by significantly reducing FX trading costs. Corporations trade on the order of $70 trillion a year – roughly the same as the total global GDP. On such large amounts, basis points matter. That’s why, to fulfil their mission, corporate treasurers are increasingly focused on ensuring that they get best execution on their FX transactions, which includes using the best available trading tools and practices. What advantages do algorithms have over other trading techniques? With the speed at which trading is conducted today, the proliferation of trading venues, and sheer levels of information that is processed, it is simply impossible for a human trader to stay on top of all the data that the market is generating. Automation frees treasurers and traders to focus more of their time on those issues where human intelligence and judgement add the most value. What factors should investors consider when choosing an FX algorithm? First, corporations should understand the bank’s liquidity model for their algorithmic offering – principal, agency or hybrid. Bank algos access liquidity differently depending on the model. A pure principal algo accesses just the host bank’s liquidity, which also provides indirect access to other liquidity pools in the marketplace. Agency models do not interact with the host bank’s liquidity, but are able to provide liquidity on ECNs as well as taking prices, potentially capturing part of the bid-offer spread for the customer. Hybrid models can offer the best of both worlds, though customers should understand how the bank manages its dual role as principal and agent. Corporations should assess the liquidity pool underlying each bank’s algorithms to determine which model will be most effective. Second, corporations should be satisfied that their bank provider has first class algorithmic trading tools – either through a major investment it has made in algorithmic trading research and development internally, or by partnering with an algorithmic technology specialist. Smart algos have sophisticated order placement logic, change their behaviour based on pair and time-specific liquidity patterns, and make intelligent and dynamic use of the real-time liquidity available across venues – for example based on order fulfilment rates. Provided liquidity and investment checks out, corporations can consider algorithmic trading as another service their banks provide, and direct flow as part of the overall banking relationship. Finally, best practice is to use TCA after the fact to track performance across bank providers and make sure all is as expected. To read more, please visit the FX-MM website here. UK Prime Minister Theresa May finally triggered the formal process for Britain leaving the European Union (EU) on March 29. While the EU referendum and a post-Brexit scenario may have been something of a blow to confidence in the City, it still has plenty going for it as a financial hub. This year’s Global Financial Centres Index, an international ranking of the world’s leading financial centres, placed London top of the pile. “London’s rating has been influenced by not knowing what will happen after the UK’s departure [from the EU],” Mark Yeandle, associate director of Z/Yen and author of the report, told The Financial Times. Despite this, London remains top of the list and, over the period which the report tracks, has even recovered some ranking points. London also remains the world’s biggest FX market by a huge margin, according to the latest BIS Triennial report. While Brexit may result in some jobs being relocated, the industry still believes London will remain front and centre and a key financial hub. This means that, far from vacating the city, many businesses are investing further in London’s future. Algorithmic trading technology provider Pragma is one such company, with the New York-based firm expanding its equities and FX business to London. “Our investment in the data center at Equinix’s LD6 site offers Pragma360 clients access to state-of-the art technology and the largest ecosystem for foreign exchange trading globally,” says Pragma’s Chief Business Officer, Curtis Pfeiffer. “Despite the uncertainty caused by Brexit, we are moving forward with this large capital expenditure because London, as the largest FX trading centre in the world, hosts the largest datacentre ecosystem for low-latency FX trading applications and we do not see that changing any time soon,” he explains. While nothing in the negotiations has been determined at this early stage, the City will also weigh up the potential challenges of Brexit. Continued access to the European single market through financial passporting and the ability to attract skilled technology professionals from across the EU to work in London top the list for many institutions. “77% of my staff in London were born outside the UK. We need those people. People are very mobile. I just worry that tough negotiations will send the wrong signal.” Michael Kent, CEO of remittance service Azimo, told Financial News. In addition, J.P. Morgan has reportedly spent the last nine months weighing up various EU cities as a potential new continental home for their operations, according to The Wall Street Journal. Looking beyond the headlines, however, the picture is more nuanced. Most of the relocation plans announced over the past few months involve relatively small numbers of staff. For many banks and financial institutions this may be a hedging exercise rather than a wholesale exodus. Going forward, the UK government is determined to ensure London remains a central part of the international financial landscape, and it’s worth remembering London has a number of strategic advantages which mean it is likely to continue to be the city of choice. It uses the global language of business, English; it is situated in the perfect timezone between Asia and America; and has a legal system that is world-renowned for clarity and reliability. None of this will change; in fact, it will continue to ensure London remains open and attractive to business. Foreign exchange (FX) is one of the world’s most liquid markets, with around USD 5 trillion exchanged across borders every day. However, there is a perception in the market that liquidity is on the wane. The pessimism may in part be as a result of the increasing difficulty in defining exactly what liquidity means in the modern market, and measuring it accurately. This was one of the questions which a recent report on liquidity in the Americas from the Bank of International Settlements (BIS) attempted to address. Traditional liquidity metrics, such as cost metrics, quantity metrics and trade impact, have their uses, but the report finds that none are a perfect way to measure liquidity in the modern market. This is important because one thing which is clear is that the modern FX market is becoming increasingly complex, making understanding liquidity more difficult. The market, like many others, is fragmenting as electrification proliferates the number of trading venues and sell side participants put more emphasis on internalising trades. Whether this fragmentation is having an impact on traders ability to trade, remains an open question. The BIS report indicates that fragmentation does appear to be having some impact on liquidity measures, particularly when it comes to periods of market stress. It gives examples such as the 2016 British EU referendum and flash crashes, where traditional liquidity metrics appear to have been impacted across a number of currency pairs, at least over the short term. This is in part because, while technology is driving fragmentation, it is also creating opportunities to aggregate liquidity in more efficient ways. “Buy-side traders have responded [to FX market fragmentation] by turning to algorithms and taking on more execution risk themselves”, says Pragma’s CEO David Mechner. Liquidity is the lifeblood of the FX market, it is vital that the market can measure it in a way which gives an accurate representation of what it is like to trade. One solution, suggested by Mechner, is a consolidated tape, much like in equities. Until then, the market should think carefully about the metrics used to measure the market and ensure they are fit for purpose. The decision by Pragma to set up a base in London shows how the UK’s capital remains the natural hub for algorithmic currency trading despite the UK’s looming exit from the European Union. While the debate about the future of London in a post-Brexit environment continues to rage on, there are many who continue to recognise the role of London at the centre of the USD5 trillion currency market. Algorithmic trading in particular continues to rise in popularity. A report from Greenwich Associates found that the proportion of volume-weighted FX trading executed algorithmically has increased two and a half times in the past three years. This trend was further highlighted by Pragma Securities, the multi-asset class provider of algorithmic solutions, which established a new connectivity presence in London to service its growing international client base. London currently accounts for more than a third of all currency trading activity globally, according to the BIS. In a news article in FX Week, David Mechner, CEO of Pragma, expressed confidence in London and its role at the centre of European and international financial markets. “Equinix’s LD6 site offers Pragma360 clients access to state-of-the art technology and the largest ecosystem for foreign exchange trading globally. Pragma is not alone in its bullishness on London’s future, and it is clear that maintaining a data centre presence remains crucial to an institution’s trading operations, particularly for FX trading. The Financial Times recently reported on Dutch data centre operator Interxion’s £30m investment in its site in London’s Brick Lane. Curtis Pfeiffer, Chief Business Officer at Pragma, also highlighted the benefits of proximity to London and risks of leaving London’s FX ecosystem. “We are moving forward with this large capital expenditure because London, as the largest FX trading centre in the world, hosts the largest datacentre ecosystem for low-latency FX trading applications and we do not see that changing any time soon,” said Curtis. Multi-asset algorithmic trading provider, Pragma Securities, has launched TradeBase, a relational database that provides clients real-time access to their parent and child FIX order messages for greater transparency to facilitate client risk management, compliance, and monitoring of their algorithmic orders. TradeBase is populated in real-time, and enables Pragma360 clients to feed their trading, risk management and compliance systems child order level trade data in a manner usually available only to firms who build their own algorithmic trading platform. The database provides a granular level of data including entries of all new child orders, amendments and cancellations, as well as child order fills. The launch of TradeBase follows the publication of a recent white paper by Pragma Securities exploring a buy-side blind spot in best execution due diligence. The paper, published in Tabb Forum analyses the order routing practices of high-touch trading desks and calls for brokers to demonstrate greater levels of transparency to clients. David Mechner, CEO of Pragma Securities, a multi-asset algorithmic trading provider, analyses growing demand among buy-side institutions for greater transparency around order routing practices and best execution. Pragma Securities, a leading provider of high performance algorithmic trading tools, has launched a sophisticated algorithm designed to improve average execution performance against the daily 4pm WM/Reuters foreign exchange benchmark fixing. Following recommendations from regulators in the wake of the FX rate-rigging scandal, in February 2015 the methodology underpinning the WM/R benchmark was changed, widening the calculation window from one minute for the most liquid currencies to five minutes. In addition, banks have largely shifted their execution of customer fix orders from the spot desk to their electronic desks, where time-weighted average price (TWAP) execution algorithms are often used. Pragma’s research highlights that together, these changes have created predictable patterns that can be leveraged to improve trading performance using only publicly available data. The full research findings are available via the Pragma Securities website. Pragma’s new SmartFIX algorithm is built on the firm’s own research, which has identified predictable patterns of trading behaviour around the key FX benchmark. The new algorithm complements Pragma’s existing foreign exchange platform offering, Pragma360, which includes a suite of execution algorithms, transaction cost analysis (TCA), risk controls, and a next-generation algorithm monitoring system called Panorama. Pragma360 is provided as a broker-neutral trading solution to banks and asset managers.